How many recipes (not just mine) ask for chicken stock? It’s also the backbone of many soups, follow my guide how to make chicken stock and you might never use a cube again. Whether it's to make a sauce or gravy for smoked chicken or simply to provide extra flavor to my potatoes and onions, a good chicken stock is essential. To be fair, this poor chicken died for your or my gastronomic pleasure so it's only fair that we make the most out of the life that has been sacrificed. Top chefs might start telling you to brown the bones blah blah blah but I find that it doesn’t matter whether you start with the remains of your Sunday roast or just kick of with a freshly dissected carcass the results are the same. The only difference to this is if you use the carcass of a chicken that you have smoked as this will produce a very distinctive flavour. The secret is to make sure that you have a good variety of other veg in the pot, you give it plenty of time for all the flavours to infuse and reduce the final mix. All pure ingredients here so not an allergen in sight. Compare that with most stock cubes where you'll usually find gluten. Chop up the carrot and celery roughly and throw into the pot with the onion and the chicken carcass. You don't need to peel anything. Add a quart (1 litre) of water, simmer gently for a couple of hours without the lid on the pot then remove from the heat and allow to cool. 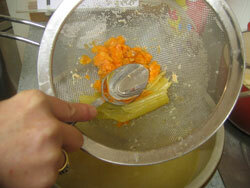 Strain through a sieve and pick out the bones. You can remove any last remaining pieces of meat and throw them back in the pot. Place what’s left of the vegetables in the sieve and use the back of a tablespoon to squash out all the remaining juices – this will give your chicken stock a beautiful sweetness. 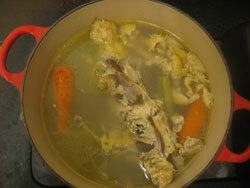 Put the stock back on the heat and reduce to half the volume, taste and season to your liking.